Afraid to get in the water? Think you’re going to ruin your swimsuit? Fear not, chlorine resistant swimsuits are here! 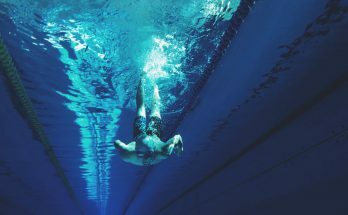 Swim enthusiasts and water lovers, this is a two-part review; Swim and Sweat‘s sweat, chlorine resistant swimsuits and their cleansing product, Suit Saver. These products work in tandem to preserve the life of swimwear, a welcome idea for those who engage in activities in chlorinated water. With this dual, one no longer needs to sit on the side lines in order to preserve their swimsuits! 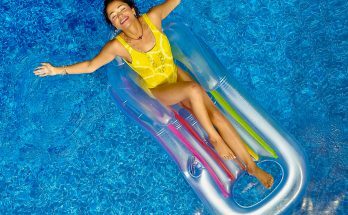 Swim and Sweat has taken two materials that are resistant to chlorine, polybutylene terephthalate (PBT), and Polyester, and designed swimwear for every shape and size. This combination of fabrics has a winning blend that has improved the average life of swimsuits. Apparently, the spandex and Lycra® combination are not as chlorine resistant as Polyester and PBT, a texturized polyester. However, in truth, a mixture of Polyester and spandex does have some chlorine resistant properties. Click Here for specific information. What Does This Mean to the Wearer? The traditional spandex/Lycra® and even the Lyra®/nylon swimsuit blends typically last about a month for the 4-5xs a week swimmers or water aerobic exercisers. The color begins to fade, even when it is washed in cold water and allowed to air dry. The elasticity slackens because the fabric is absorbent and can lose its shape. Now, with these polybutylene terephthalate (PBT), and Polyester suits, wearers have experienced suits that have lasted for 1 or more years. Plus, colors didn’t fade and their suits didn’t stretch. The best part is that they didn’t have to purchase another suit as quickly as they had in the past. How Do These Swimsuits Look? Swim and Sweat have an awesome catalog of suits that cater to the sizes 6-18, sizes 16W-26W, those with back, bust, belly, and leg issues, and even those who have had mastectomies. There are an assortments of styles, mostly one-piece and tanktinis that are flattering and form-fitting. Prices range from $49 and up. I did not see a single bikini. The About Page doesn’t specify, but judging from its merchandise, the suits are geared for those who need swimwear that can stand up to chlorine. Click Here to see the merchandise. The site also has a list of brands featured like popular TYR, Waterpro, Speedo, to name a few. All quality companies with well made, durable and fashionable swimsuits. Swim and Sweat has another great product on their site called Suit Saver. Yes, a cleaning agent that can clean chlorine out of one’s swimsuit. Out of more than 100 users, each customer gave this product a five star rating, making its claims believable and substantial. For only $6.75, product comes in a 2.2 fl. oz container and can last for approximately 50 washes. It contains no detergents, dyes, or perfumes, and it washes the garment, removing dirt and chlorine and odor. As a bonus, it preserves the color as well. You Can Keep Your Lovely Swimsuit Longer! My first swimsuit was a pretty, green swim dress from LL Bean. Can’t even begin to say how many compliments I received from wearing it. It was perfect! Plus, it covered the parts of my body I didn’t like showing then. I felt like I was fully dressed when I stepped out of the pool, which is great for travel – no need for a wrap. Unfortunately, after six months of swimming practically every day and switching suits daily, my beautiful suit practically became a gown. The skirt part would hang down below my knees and get tangled up in my legs as I swam. The color went from jewel green to pastel. If only I had Suit Saver. I would still have that suit. Alas, I’ll just buy another one and now I’ll even get to keep it. If you’ve enjoyed this post, please leave a comment below. <–Like this post, see how to protect your skin in chlorinated water too. Next Article Powerbreather Snorkel Review – What’s so great about it?